Since I’m thinking of cross-dyeing the finished fabric, I thought it would behoove me to make sure the acid dyes wouldn’t affect the cotton. While acid dyes are generally not effective on cotton, some of them can stain. So before investing a lot of time in weaving the fabric, I figured it would be a good idea to test the dyes. 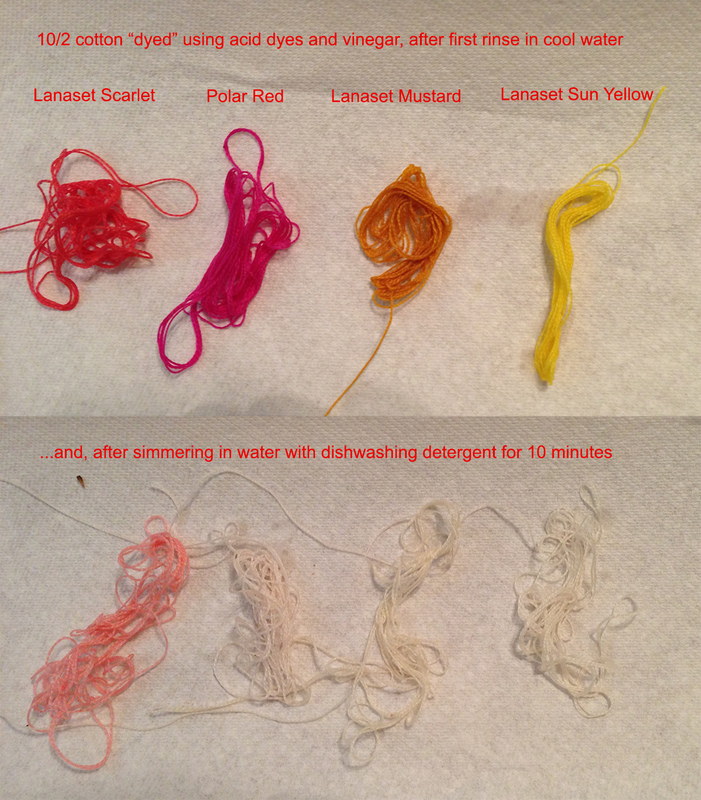 So I spent some time last night “dyeing” the yarns with acid dyes and then trying to remove them by washing. The interesting part is the scarlet, which stained the cotton a pale pink that was not removed by washing. This suggests that scarlet would be a bad choice for overdyeing, if I want the phoenixes to remain bright lemon yellow. However, if I want to dye the phoenixes to match the background slightly, to give the appearance of flying through fire, scarlet might do very nicely indeed. Something to ponder and play with! I have now cut out the first kimono muslin and sewn a few of the pieces together. Either uchikake are hugely oversized (which is possible since they are outerwear, meant to be worn over a full kimono I think), or I’m doing something wrong. I’m going to sew it up later this morning and see how it looks. I suspect I will do some major alterations to make it fit without an under-robe. It would also trail on the ground by about 8″, which I think is normal for uchikake. However, I will probably shorten it to ankle-length and see if that works. After I finish the kimono muslin, I think I’ll have to ponder the cut of the garment. I’m going up to see Sharon (my sewing mentor) this coming weekend, and will ask her for her thoughts on the design. I may do some radical alterations to the shape of the garment. And I may not. The original reason for keeping the cut simple and rectangular was to avoid chopping up phoenixes, but if I am cross-dyeing and will only have a few phoenixes visible, I can keep them away from the seamlines, enabling a more complex cut. I really would like some shaping around the armholes. I’m also planning the sample warp for my piece and debating what to do. I would really like to do a full-width sample warp, 10 yards long, to allow the best possible simulation plus room for lots of play. But at the same time, I don’t feel entirely settled on the idea of cross-dyeing – what if I weave the first ten inches only to find that the idea doesn’t work, or is too tedious to weave? Then I’d either have to waste ten yards of silk warp (!) or waste time figuring out something else to do with it and then weaving it off. Also, I don’t yet know the finished sett, so I might wind up with something narrower or wider. Narrower is not a serious issue, but wider would mean dropping ends off the back of the beam, which is a pain to deal with. The real problem is that I have two questions to answer. The first is “Is this idea viable at all?” and the second is “Where do I want to go with this idea, if it is viable?” I can reduce the time cost of running both experiments by using a single warp for both. However, that also increases the risk of wasting either warp or time if the first experiment fails. Trade-off: ten yards of silk warp (or the time to design and weave off variants on the same) vs. time spent re-warping the loom. Tough call. I’m inclined to take the riskier path, mostly because I have tons of yarn and not much time. A 10-yard warp will take about ten ounces of 60/2 silk, and since I paid only $35/lb for the silk (bought as a remainder), that means I’m risking a total of $22 in yarn. Measured against the considerable time savings of avoiding warping twice, that seems like an eminently reasonable risk to take.